For the first time visitor, Lofoten might seem to have an overwhelming selection of hiking trails available. The Islands have every hiking option for every experience and fitness level. There are easy coastal walks for families or steep mountain scrambles suitable for the fittest adventurers. 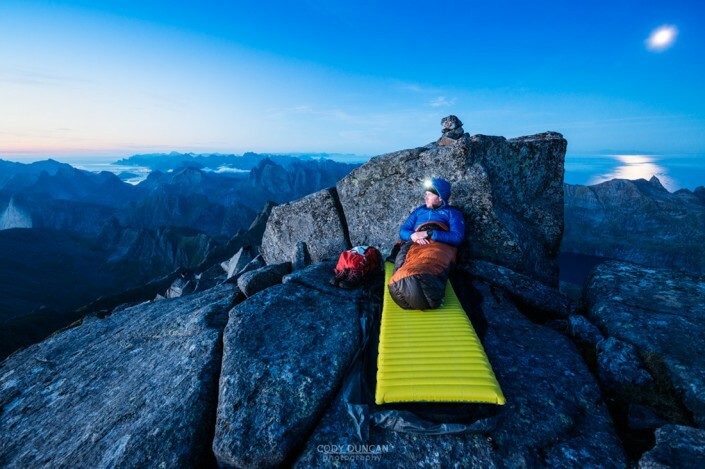 That being said, the overall standard of Lofoten’s trails, particularly those leading to mountain summits, tends to be better suited to the more experienced hiker. 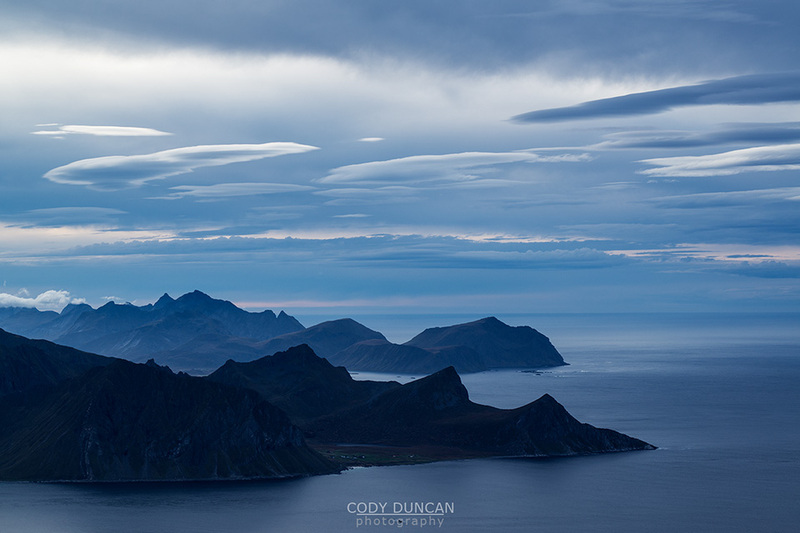 The steep, rugged nature of the Islands, with often unmarked, rocky and slippery trails, and quickly changing weather can provide difficulties to the less experienced. Typically, most trails are unmarked, and sometimes finding the trailhead can be the biggest challenge. Even without signposts or markings, the more popular routes will have an obviously worn down trail to follow through the landscape. The lack of forest means visibility generally isn’t a problem for navigation, though if you’re in the clouds, route finding can sometimes be difficult. And in poor visibility, always be aware of potentially steep drop-offs, especially when nearing a mountain summit, as many peaks end in a sheer cliff. While some mountains like Reinebringen are known for their iconic views, I think it’s generally better to choose a hike depending on what type of route you are looking for. To put it simply, the only bad views I’ve had from a mountain top on Lofoten are times when I’m in the clouds and can’t see anything! Otherwise, unless you’re from Norway or perhaps somewhere in the Alps, any of Lofoten’s peaks will have absolutely fantastic, world class views! In the endless days of summer, the term ‘day hike’ has something of a relative meaning and I often find myself preferring to hike during the middle of the night. You can leave the headlamp at home between May and early August. The use of the term ‘marked trail’ on Lofoten might give a bit of over confidence to hikers used to more civilized mountain areas of southern Norway or the Alps expecting maintained trails and proper sign posting. The reality on Lofoten is more like someone painted a red dot on some rock or a random tree back in 1997, and nothing has been done since. Or, in the case of the Munkebu hut trail, it seems like someone must have gotten mad at people complaining of poor trail marking, and some time in mid summer of 2016, came along with a can of spray paint and painted a bunch of ugly bright orange arrows on the rocks. Not particularly nice looking. 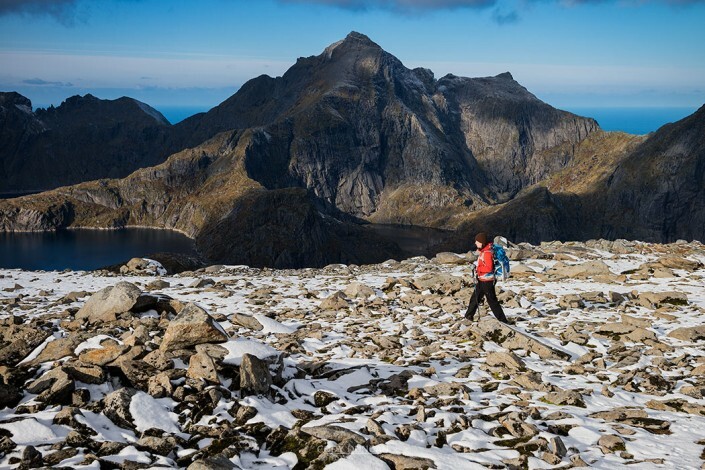 In terms of the physical quality of the trail, a marked trail on Lofoten means little and the hiking can be as difficult as any other route on Lofoten. 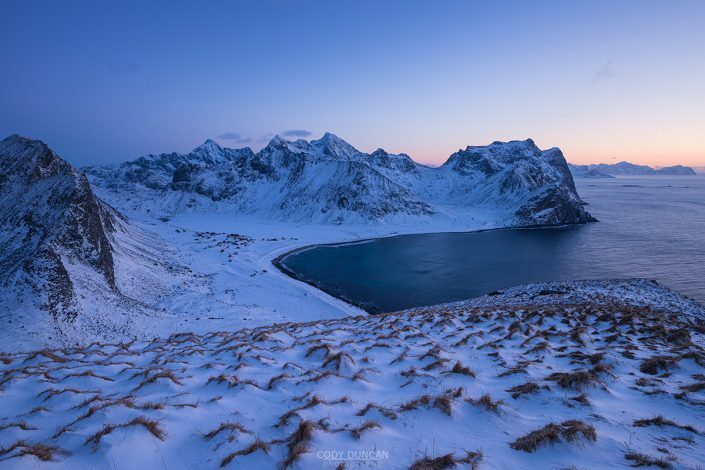 And, because there is no formal organization to maintain trails on Lofoten, marked routes are more likely to be in much worse condition than other hikes across the islands. This is due to the fact that the main travel websites and guidebooks to Lofoten often reference the few main marked routes, which sounds logical, since they are marked routes. However, this means they receive a much higher amount of hiking traffic than other areas of the islands. The result is that the lack of trail maintenance means some routes have deteriorated into absolutely muddy swamps of a trail, such as the Selfjord – Horseid trail. This ends up with multiple, muddy paths being worn across the land in an attempt to avoid boggy areas, which then themselves become the next boggy area to be avoided, scarring the landscape for years to come. The narrow width of the Islands means you can never really get too far from any roads or signs of civilization. This, combined with often vertical mountain faces means the Islands are not really set up for long distance hikes as a single route. If you are looking for a hike of more than 2-3 nights in the wild, you are going to have to string together several different day hikes and most likely cover some sections of road to link things together. On the bright side, this means you can generally refill on supplies every few days, so there is no need to carry a weeks worth of food. An example of a possible multi-day route, which would take in some of Lofoten’s best views and with good camping options, is to link together the beaches of Moskenesøy: Kvalvika, Horseid, and Bunes. Day 1: Exit the bus at the Fredvang bridges on the E10. Walk towards Fredvang and then traverse over Ryten – one of the best views on Lofoten – on your way to Kvalvika beach. Camp at Kvalvika beach. Day 2: Begin walking towards Horseid beach. The first half of the route is 5km of road before the trail begins. Camp high in the mountains at Fageraskaret pass and take a side trip to the summit of Markan or Branntuva, the latter with stunning views over Horseid beach. Day 3: Continue on towards Horseid beach and set up camp on the small hill next to the water on the right side of the beach. Collect some driftwood and enjoy the day. Day 4: Hike towards Kjerkfjord and catch the ferry to Vindstad. From VIndstad, hike to Bunes beach for the night. Take an option side trip up Helvetestind for more epic views over Bunes beach. Day 5: Return by ferry to Reine, or continue to Forsfjord and hike to Hermannsdalstind or Munkebu hut. Austvågøy also has several options for putting together a similar type route. While any route or mountain can be hiked at any time of year given the right experience, if you want snow free access to the mountains, then the months of July, August, and September will be your best choice. There are lots of weather statistics and anecdotes about June being sunnier and autumn being rainy, etc. While this might be the trend over decades and decades, in reality, the weather really does what it wants, when it wants. So unfortunately, it’s impossible to say that June 20-30 will be better than July 20-30. You will never know until you step foot on the Islands. With the arrival of the midnight sun in late May, the Islands are finally beginning to escape from the grip of winter. Depending on the year though, there can still be substantial amounts of snow in elevations above 400-500 meters, particularly in more inland mountain areas. Early to mid June can also still see many of the inland mountain routes still snowed in, particularly on Austvågøy. Warning: Spring on Lofoten (late April to mid June) is also a period of elevated rock/snow fall as the mountains begin to thaw. Even the E10 on Flakstadøy was closed several times in the spring of 2016 due to rockfall. Avoid hiking below steep mountain faces or any other routes which you cannot clearly see what might fall on you from above. By early July all but the highest routes on unusually cold years should be snow free as the midnight sun has remained in the sky for over a month. With the passing of August into early September the nights begin to lengthen as the coming winter approaches. 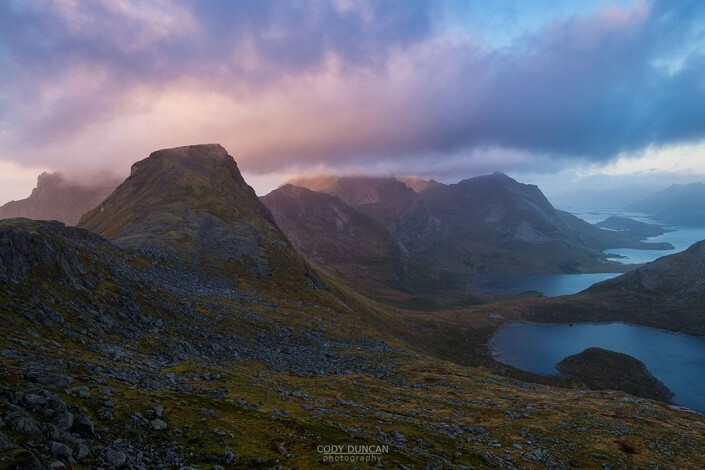 September nights can begin to drop below freezing in the mountains and some snow might begin to fall, though it usually won’t stick around for too long. October becomes a bit riskier if hiking is your goal, with some years seeing early snowfalls and other years with quite mild weather.